Your event is much more than a cool display collection. In the business world, successful events are experiences. The food you serve, whether it’s at a corporate meeting, a tech expo or a major industry extravaganza, will give your consumers a specific feeling towards you as a provider. Keep in mind: Your catering menu is important. It can make, or break, an event—and we’re here to tell you why. Time is of the essence. Before we get to the attendee’s mindset, we need to talk about the clock. If you hire a catering company, make sure the prepared menu is simple, delightful and memorable. Make sure you don’t need a ton of time to plan, cook, serve and pick up the dishes. You’d be surprised how much can go wrong if an event’s menu is overcomplicated. Second, versatility should be considered. A versatile menu—one with detailed options—can inspire creativity from the get-go. A rigid menu, however, may turn your attendees off, food-wise. Make sure you’re offering at least three main courses, and sprinkle a little creativity atop the side items and appetizers. Remember: It’s an event. Your attendees will be hungry, but they’re more likely to indulge in savory apps than a full-course mean. The biggest way to kill event dining interest is to lack specialty options. No, not diverse options—specialty options. We’re talking diet food versions, vegan options, soy-free food and vegetarian dishes. You shouldn’t assume your eventgoers are a diet-free crowd. Offer dietary accommodations, and set yourself apart from leading competitors. Oddly enough, spices tend to be “make or break” topics for event-goers. Offer dish variety with spices. From side items to meats, a lot of cuisines can be changed based upon their included spices. Italian, Indian and Mexican cuisines, in particular, are highly susceptible to various spices. No one likes a stingy event provider. A catering menu can shatter interest if it doesn’t offer a few free side items. No, you don’t need to ditch the RSVP, but you should be flexible when guests ask for more bread, soda or similar inexpensive items. If your event has dips, consider implanting a buffet bar for pre-entrée experiences. 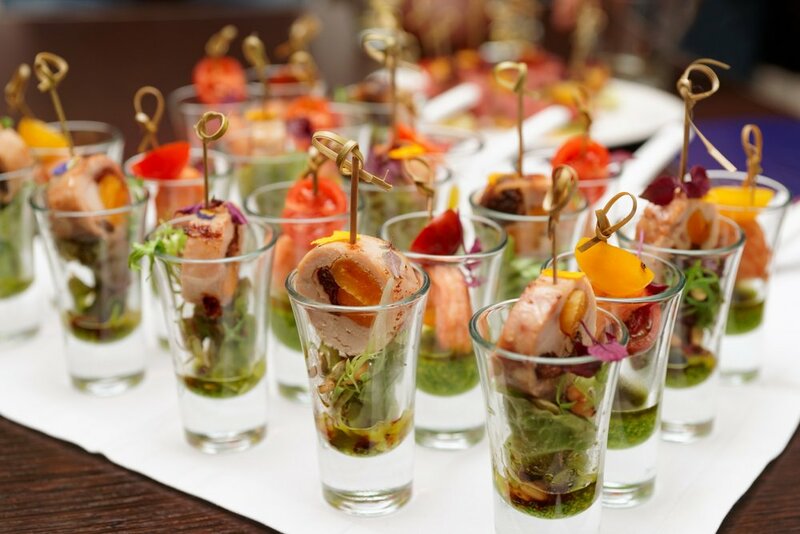 Your event isn’t defined by its catering menu, but it can certainly benefit from a good one. At the same time, a poorly constructed, restrictive or otherwise uncreative catering menu can destroy an event’s legitimacy. Food can define a brand’s quality, attention to detail and willingness to include attendees. Make sure you do it right, and contact Soho Studios today. Our in-house Starr Catering Group is here to help, and it's fully packed with exclusive kitchen amenities, time-tested-and-true recipes and today's latest, greatest menu options. Older PostJoin Marshmello and Friends Live at Soho Studios!